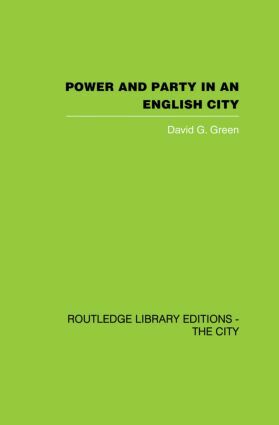 Power and Party in an English City provides an account of how decisions are taken by the state at the level of locality. More specifically, it is an account of the private policy-making activities of a ruling Labour group of councillors in the major English city of Newcastle-Upon-Tyne. Despite the fact that local government in most of the towns and cities of England is one-party government, very little is known abotu the private behaviour of ruling party groups. In this book David Green provides a penetrating empirical study of the realities of local government. The author seeks to examine and analyse the importance of party discipline, the relationship between the Labour group of councillors and the party outside the council, the power of the committee chairmen, the role of local patronage and the openness of the local policy-making process. The government of Newcastle is perhaps the most closely association in the public mind with T. Dan Smith, the corrupt local politician. In fact, Smith had left local politics in Newcastle in teh mid-1960s. How was the city being run a decade or so later? This study is however much more than an inside view of the affairs of a single authority. The last part of the book is devoted to a discussion of aspects of some traditional and modern theories of democracy and specifically to what author sees as the inadequate advocacy of participatory democracy in recent years. Green makes a major contribution to our thinking about the kind of democracy that is possible in modern large-scale societies, explores weaknesses of moder theories and puts forward some original modifications to modern democratic theory, in the light of a theory of knowledge which is seen as more appropriate for modern natural and social scientific activity.